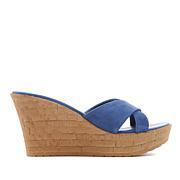 Easily dressed up or down, this slip-on sandal boasts of first-class style. 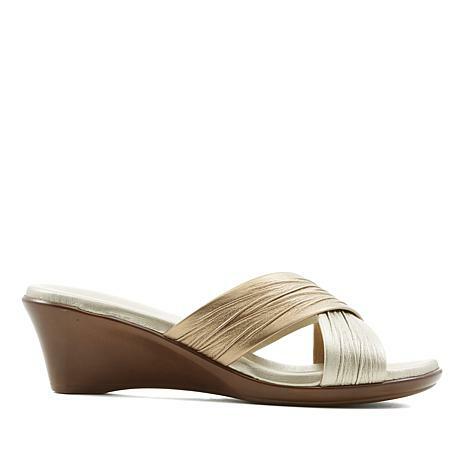 Crafted with gorgeous ruched detail, a padded insole and a sturdy unit wedge heel, the must-have design delivers comfort, value and sophistication to your warm-weather looks. These sandals fit and feel like a "slipper".....no breaking in time needed! They look more expensive than they cost and, they are so classy looking. You can dress these up or down! I bought these on Sale but, they are worth every penny of the Regular price for sure!! They fit to size as well. I recommend them highly!! These Italian Sandals are Beautiful. I ordered the champagne. So very comfortable and Well made, perfect height. Very feminine! Love them! I have narrow feet and these were perfect. 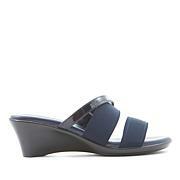 Many times, my toes slip out the front end but these sandals hold them in place and are comfortable. I ordered the black and the beige with white. Happy with my purchase fits true to size. I am a 7.5 medium width and 7.5 med fit well. I ordered my correct size and the shoes fit in length and width, however, I couldn't get them to stay on as I walked. My feet would slide right out of the shoe. Also the crisscross did not go across my toe area as I felt it should for proper coverage and it hit and missed my toes making these unable to wear. I fell in these shoes..the support was terrible for me. Pretty on the foot I had no issue with looks , but the shoe also squeaked when walking. Sadly I kept them too long hoping the noise would go away, it didnt Im stuck with them.